On the water. There are many different ways of exploring Baikal’s beauty, but one of the most exciting ones, of course, is traveling on the water. To experience Baikal’s huge body of water or explore its numerous tributaries you can travel by canoe, kayak, raft, boat, catamaran, yacht, or other means. For longer cruises and travels even to the remotest corners of Lake Baikal, charter boats of the type “Yaroslavets” or yachts are mainly used and recommended. For fans of active water travel, the Selenga, Turka, Kurba and Barguzin Rivers are best for rafting and kayaking. Moreover, there are many possibilities for canoeing or kayaking on the shores of Lake Baikal. Traveling by canoe or kayak allows you to cover sufficient distances per day to observe from the water the wonderful landscapes and wild animals of the lake. The Zabaikalsky National Park, the open waters of the Chivyrkuiski and Bargusinski Bays, as well as the east shore’s coastline are the most suitable and beautiful places for kayaking. The Yaroslavets-class Charter Boat is the most common boat on Baikal with a length of 21 meters, 4 meters width and a cruising speed of 16-18 km per hour (10 mi/h). The boat has 3 separate cabins, each with 4 berths (2 bottom and 2 upper berths), and is equipped with caboose, toilet and shower. The boat’s draft enables it to land in most places on the shores of Baikal. Yaroslavets boats also withstand extreme weather conditions with waves up to 2 meters and wind speeds of 15 meters per second, and are equipped with all necessary navigation devices. The ideal number of passengers comfortably placed on board is 8 persons. It is possible to rent a motor yacht for charter cruises on Lake Baikal. The journey on a yacht is more comfortable than on the Yaroslavets-class boats, since its engine operates softer, thus generating less noise. Keel yachts can only land in places with sufficient depth; therefore the dinghy (inflatable boat) is an indispensable device to go ashore. The rental fee depends on the yacht’s class, number of seats and season. In general, renting a yacht is more expensive than a Yaroslavets-class boat. Kayaks are also an exciting way of exploring the lake. Frequent winds even allow the use of sailing equipment; thus it is possible to cover considerable distances under favorable wind conditions. Hiking. 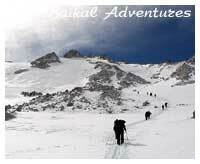 Hiking tours allow you to explore the most remote corners of Buryatia that are inaccessible by any means of transport. Over the years, the Baikal region has attracted more and more tourists wishing to explore nature’s beauty by foot. The increasing interest in hiking tours is sparked by the great variety of landscapes and the unique natural monuments of the Baikal region. Here you can experience nature in its full beauty of mountain ranges, glaciers, steppes, forests, volcanoes, rivers and lakes, as well as hot mineral springs. These are the most interesting places to be explored by foot: the Barguzinsky Mountain Range, the Holy Nose peninsula, the Hamar-Daban Mountain Range, the Eastern Sayan Mountain Range, and the Tunkinsky alpine tundra belt. When hiking to remote areas special camping equipment to use overnight and prepare meals is necessary. Horses can be rented to carry the heavy outdoor equipment for your trip. Horseback riding. The Buryat people used horses in ancient times, and treat them in a very respectful way. For a long time, horses were the only means of transportation, and the majority of household activities were carried out with their help. The Buryat horses are adapted to long journeys crossing mountain ranges, deep mountain rivers, and steppes. 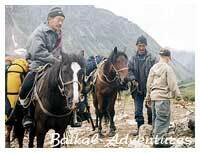 Nowadays, we have the wonderful possibility to experience real adventure with horseback riding in the Baikal region. Horseback riding is a very ecological way of traveling that allows you to feel oneness with nature and discover the surrounding beauty. The East Sayan Mountains in the Okinsky and Tunkinsky districts, and the mountains and foothills of the Barguzinsky Mountain Range are the most interesting places for horseback riding. Bicycle adventures. Riding a bike is the fastest, cheapest, and most ecological way of moving powered by physical strength. Cyclists move considerably faster than a hiker or a kayaker. A ramified network of roads and paths in the Baikal region make bicycle adventures very popular. On a bike you can enjoy fast changing impressions of unique landscapes and feel every meter of road and each whiff of wind. Extreme, remote and peaceful places are accessible this way. Moreover, cycling is a universal remedy to strengthen physical and psychological health. It can be performed both in summer and winter. Of great interest are winter biking tours on the ice of Lake Baikal with overnight stays in hunting lodges. Mountaineering. Ascension to the summits. Nowadays, climbers from Buryatia and from other regions have basically explored all main mountain ranges in the Baikal region. Mountaineering with different degrees of difficulty can be performed in the Eastern Sayan Mountains, in the Tynkynsky Golchy, in Burguzinsky Mountain Ranges and in the Kadar Ridge. Mean heights of the summits range between 2500 and 3000 meters. 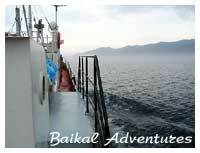 «Baikal Adventures» - the best travel on the deepest lake of our planet - Lake Baikal.